Safe Schools, as most Australians have come to realise, combines a praiseworthy anti-bullying component with more than a few of the fashionably crackpot notions of gender and queer theorists. Originally intended for both primary and secondary school students, the program presents ideas like gender fluidity and the social construction of gender as unshakeable facts, rather than postmodern fads. A few of the program’s pedagogic tools also raised eyebrows. For the four and five year olds, who may have a lingering affection for the gender binary, there is the children’s book The Gender Fairy. In this narrative, the eponymous hero guides two transgender characters along the path of social transition. In my boyhood, back in the distant 1990s, I liked best the cisnormative adventures of Noddy, Big-Ears, and Mr Plod. Today, no doubt, they would be denounced for corrupting the minds of Australian youth. To the bill of complaint against Safe Schools one might also add the inappropriate role-playing activities, wherein teenagers imagined themselves without genitalia; the advice for teachers, who should refrain from heterosexist terms like ‘boy’ and ‘girl’; and, finally, the infliction of the program upon students without the consent of their parents. In response to the public backlash and an independent review, the Turnbull government has made a few changes: the weird stuff is out and the anti-bullying emphasis stays in; there is an expiration date for federal funding and the program will ultimately be absorbed into a new government initiative, the Student Wellbeing Hub. Score another one for the cisnormative hegemony, or rather, let us simply call it good sense. The departure of Roz Ward serves as a fitting denouement of the Safe Schools saga in 2016. What remains startling, though, is how she managed to acquire such extraordinary influence in the first place. This is what I mean when I say that her critics could benefit from a little extra fibre and fervour. Roz Ward is a useful, if frightening, demonstration of what happens when left-wing academics and their ideas intrude upon wider society. Once upon a time, I have been told, postmodern jargon and critical gender theory were confined to the abstruse and unreadable journals of the academic Left. Now, it’s all available at a school near you. Marxism offers both the hope and the strategy needed to create a world where human sexuality, gender, and how we relate to our bodies can blossom in extraordinarily new and amazing ways. It will only be through a revitalised class struggle and revolutionary change that we can hope for the liberation of LGBTI people . . . it’s only the working class that shares the interests of all oppressed groups in society, because we can only meet the needs of everybody by taking collective ownership of everything. That last part strikes a sinister note, at least among anyone with a sense of history and reality. It should be clear, though, that Ward and her co-thinkers are the real thing: they’re real revolutionaries, and we should do them the courtesy of taking them at their word. To get an idea of what’s in store for us next, Australians would do well to look at the debate over gender identity in Canada, where things have gotten, shall we say, mind-bogglingly odd. He spared the audience an explanation of this remark, but assured everyone that the scientific consensus, as well as his credentials as an “historian of medicine,” backed him up. The context of this discussion was the passage of Bill C-16 in the Canadian House of Commons. This law would “add gender identity and gender expression to the list of prohibited grounds of discrimination.” The sticking point, however, has been the expansion of language: an infinite number of gender identities demands an infinite number of invented pronouns, like zie, zir, and hir. Herein lies the key criticism of the law’s potential reach: misgendering, or referring to someone by unwanted or incorrect pronouns, is not a mere social solecism, but something much more. On The Agenda, Matte argued that the law was necessary, because misgendering amounted to abuse, a hate crime, and an act of violence. He levelled all these accusations against fellow panelist Jordan Peterson, a psychology professor who has become infamous for his refusal to bow to the linguistic demands of campus activists. Three cheers, and make them rather hearty ones, for Jordan Peterson. Up with whacky gender pronouns he will not put. His stance is based on the classically liberal idea of free speech, as well as — and I don’t think this is too grandiose a way of putting it — a defence of civilisation. In this atmosphere of campus intolerance, of which speech codes are just one part, Peterson finds the totalitarian cast of mind, echoes of the Soviet Union, and an assault on our very notions of reality. Abandoned and denounced by his University of Toronto colleagues, he marches on, a one-man army against the postmodernists, radical leftists, and social justice warriors. I find Peterson persuasive and — this adjective will be outlawed soon, so dash it, here I go — manful. As I noted, Australians would do well to pay attention. Roz Ward is out and the schools are somewhat safer, but the gender wars, on the Australian front, are just getting started. Things could get a whole lot worse. 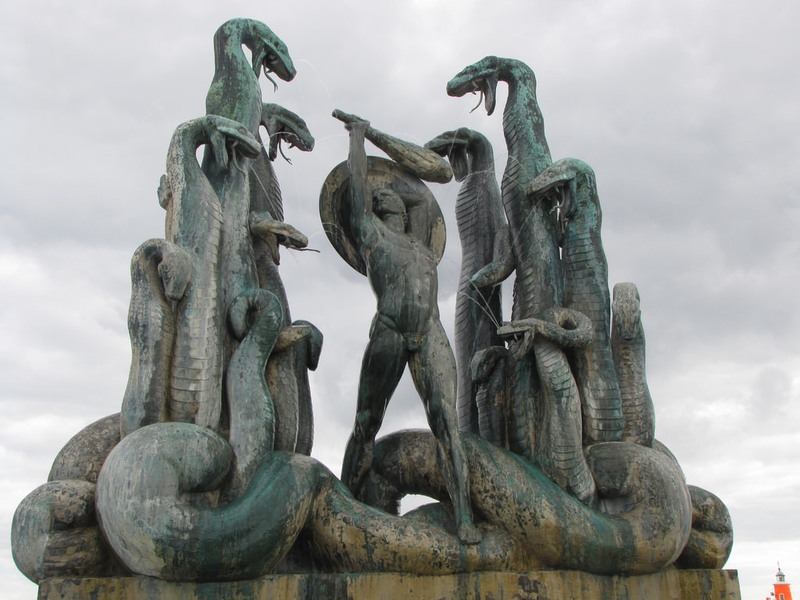 When they do, the arguments and model of Jordan Peterson will be part of the intellectual weaponry on which we must rely. Bill C-16 doesn’t specify pronouns – some American media confused this federal law which was recently adopted with an existing provincial institution which only operates under provincial legislation. It’s possible that Peterson could be called in front of the province of Ontario’s Human Rights Tribunal, which can levy fines. This year the province of Quebec’s Human Rights Tribunal fined comedian Mike Ward, who had made jokes about a young man who is a public figure and who suffers from a rare disease, $ 35,000. Also, the OHRT has been cited in Senate. Pro-nouns are included in that. I should also point out that the OHRT was on the FAQ part of http://www.justice.gc.ca but was memory holed. An important note is that C-16 was *not* recently adopted. Rather, it passed the House of Commons (with NO recorded vote). It is now with the Senate and its second reading debate has been reported to continue in Feb.
It’s true, I tell you. Historically, the only safe and creative space for gay and trans people was among the industrial proletariat. In the coal mines and steel foundries, attitudes were so liberal and progressive that one often had to search hard for a cisgendered heterosexual male. 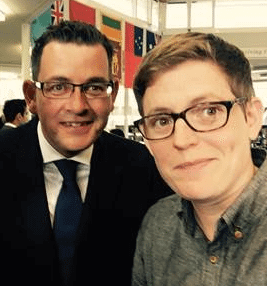 By the way, thanks for the photo of Roz Ward with Premier Daniel Andrews. But which one is which? These are strange times we live in. That there is a vocal and radical fringe that believes that if we stop socializing people with gender-binary affirming conditioning that a million and one facets of gender will emerge and thus end the hetero cis patriarchy…. whose ideology stands starkly opposed to the inculcation of tolerance and rather supports a massive population-wide social engineering experiment aiming to wipe conventional gender ideation away. Yeah, that’s a) ethical, and b) practical. Thanks to the author for connecting this to a overtly Marxian paradigm. You need to shut down their University departments. All you are doing is funding their propaganda. This is a cultural war. Previous PostWhat is a Sexist?